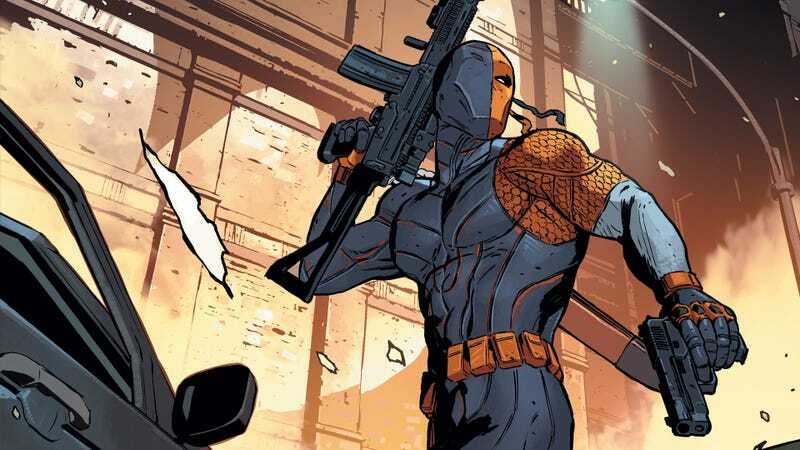 DC Comics villain/anti-hero Deathstroke might be getting another shot at the big screen after new The Batman director Matt Reeves probably wrote him out of that movie’s script, with The Hollywood Reporter saying that Gareth Evans is in “early talks” with Warner Bros. to make a Deathstroke movie. The Hollywood Reporter story also says that the movie is being pitched as a starring vehicle for Joe Manganiello, who was set to play the one-eyed assassin in The Batman before Reeves took over—and whose status in the project has been questionable since earlier this year. Evans is the director of beloved action hit The Raid, and Deathstroke is a character whose powers are typically just enhanced strength and reflexes, so putting those two together could make for a particularly brutal superhero movie. Evans will just have to avoid the current storyline where he’s a cape-wearing “good guy” on a team of young heroes who hate him and the classic Teen Titans series from the ‘80s where he kinda maybe slept with an underage girl, and nobody will even need to worry about understanding complicated comic book mythology. Just put Manganiello in that awesome mask, have him punch and shoot his way through a million dudes, and Evans will be all set. This news comes as Warner Bros. has begun developing multiple spin-off movies about DC villains, with Martin Scorsese possibly producing a movie about the Joker and Jared Leto possibly starring in a totally unrelated movie that is also about the Joker.